(CNN) - As a first grade teacher, Julie Miller is exposed to a horrifying number of germs on a daily basis. "I've been thrown up on; they sneeze and cough on me. And lost teeth are a real big thing for first-graders," said Miller, who is starting her 25th year as a teacher and works at Spring Hills Elementary in suburban Chicago. School just started, but she's already had a couple kids get sick in her classroom. "They're so cute and unaware, though. They'll have boogers hanging out of their nose and will be talking to you and not think anything of it. Some teachers flip out, but I tell my students, 'Go get a Kleenex and wash your hands.' When they sneeze, I teach them to do it into their elbows. They learn eventually." On average, elementary school children get six to eight colds each school year, according to Johns Hopkins Medicine. For high school kids, it's about half that. Both groups are at high risk for the flu. Teachers and parents commonly refer to this cold and flu phenomenon as the "back-to-school plague." Miller isn't worried about her own kids. Her son Justin is in 5th grade and daughter Kaitlyn is a high school freshman. "I've taught my kids healthy habits; I'm sure they'll be fine," she said. She makes sure they get plenty of sleep and regular exercise and they eat a healthy diet. She's taught her children to wash their hands often, and she's been known to hook antibacterial gels on their backpacks for when they can't. "I'm not a germaphobe like some of my colleagues who have put antibacterial lotion all over the place: their cars, their classrooms," Miller said. "I do feel like some germs are OK."
Kids are most likely to get colds in the fall and winter. In part, that's because they're now indoors and in close contact with their fellow germy friends. It's also because cold viruses love low humidity. In these months, your nasal passages get drier, and that makes them magnets for the 200 viruses that can cause infections. Germ candy stores: that's what Dr. Harley Rotbart, professor emeritus of pediatrics at the University of Colorado and author of the book "Germ Proof Your Kids," calls schools. "It is stunning how many times kids touch their faces and then touch other kids," Rotbart said. "This is a very touchy-feely demographic, and that's how we share germs. ... And the little ones don't have the same exposure to germs that we do, so until their immune systems get built up, they get sick." Schools are full of "hot zones" for germs, Rotbart says. "Most people think that's the bathroom, but it really isn't. Those get regularly cleaned." If he had to rank the germiest places in school, No. 1 would be the drinking fountain. It's germier than the toilet seat, he says, but "doesn't get disinfected as much." Plus, it's the perfect spot for kids to ingest these microorganisms as they put their mouths on the stream of water -- or right on the fountain itself. Cafeteria trays are another germ hot zone. "Those don't get wiped down nearly as well," he said, recommending that kids bring the tray to their table and then use hand sanitizer before they pick up their food. "There is a real delicate balance, though; we don't want to make kids paranoid," Rotbart said. "We need to be prudent. 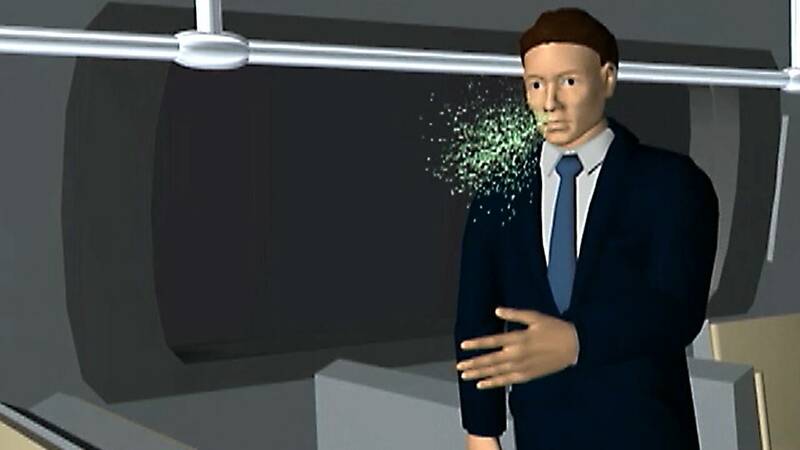 Germs, for people who are healthy, really aren't a big deal." The Centers for Disease Control and Prevention highly recommends that students get vaccinated each flu season. It also advises students to stay home if they are sick, especially if they have a fever. They should be fever-free and have stopped showing signs of being sick like being flushed or sweating for 24 hours before going back. That helps keep germs from spreading. Rotbart also tells parents to make sure their children get enough rest. School-age children should be in bed nine to 12 hours a night. High schoolers need eight to 10 hours, according to the CDC. Sleep deprivation lowers the immune system's ability to fight off infection, as does stress. Exercise, Rotbart says, is another effective way to keep kids healthy. He suggests a daily dose of 40 minutes of running-around time, even in the winter. If it's cold, children need to keep their jackets zipped and hats on their heads. "Your mother was right: Studies have shown that people who do bundle up against the cold are less likely to catch colds later on in the year," Rotbart said. Keep your distance from people who are sick. Teach your kids to avoid touching others when they are sick, and remind them to stop touching their eyes, mouth and nose, since this spreads contamination. Every year, Miller invites a nurse to teach her first-graders the proper techniques. She uses her bathroom as the place to remind kids about hygiene. "I have three posters around my sink about good hand washing. I review the rules as well as anyone who's supervising the kids during that time. I encourage them to wash after they go to the bathroom and after recess, before they eat anything," Miller said. "If I don't hear them wash their hands -- even if I'm in the middle of a lesson and the principal is doing my evaluation -- I stop what I'm doing and say, 'Wash your hands.' It's that important." Judy Harrison, a foods and nutrition professor at the University of Georgia, says studies she's conducted show that most kids don't know how to wash their hands properly (only 28% knew the right method). Properly washed hands cut down on gastrointestinal problems, as well as cold and flu. Harrison designed the "Wash Your Paws, Georgia!" hand-washing initiative. "I teach them to sing 'Happy Birthday' to yourself twice to make sure they wash for at least 20 seconds," Harrison said. She also teaches them to clean between their fingers and around their fingernails and to use a clean paper towel or a hot air dryer to dry off. A lot of people think hand sanitizer is better, she says, but really, washing with soap and water is the most effective way to eliminate germs. But if kids can't get to a sink, make sure the sanitizer is at least 60% alcohol. "My kids are obsessed with hand sanitizer," said Amy Falcone, a fifth-grade teacher in suburban Chicago. "Each classroom has a hand sanitizer dispenser on the wall. Many use it to an extreme." Falcone used to think the "school plague" was more of an elementary school thing, but with increasing pressure to get good grades, some of the older students she had when she taught seventh grade science did come to school sick. And that gets others sick. "I've never been a sickly person, but I did catch strep throat," Falcone said. "I've never had it in my entire life, but I had it. Got rid of it. Got it again." Falcone's been teaching for more than 20 years. She's noticed over the years that newer teachers get sick more often. "When you are new, you are killing yourself to impress, and some young teachers really do forget to take care of themselves," Falcone said. She advises new teachers to mind their own health. "Eat healthy, get sleep, do whatever you do to reduce stress. Staying healthy is totally doable."